The sun rose this morning in a cloudless sky and it was obviously going to be a beautiful summer’s day. There was a fresh breeze from the north-east. 8 a.m. to 10.30 a.m.: Bombardment of strong-points. Final registration by field batteries. 11.05 to 11.20 a.m.: Bombardment of enemy front line. 11.20 to 11.30 a.m.: All guns cease fire, except those on enemy’s line of approach. Infantry cheer, and show fixed bayonets above trenches to induce the enemy to man his parapets. 11.30 to noon: Intensive bombardment of enemy front line. 12.00 noon: Batteries increase their range. Infantry, first wave, assault 1st objective. 12.15 p.m.: Infantry, second wave, assault 2nd objective. At 6.00 a.m. the 1st KOSB’s adjutant, a Captain Paterson, went round the trenches. ‘Everyone’, he recorded in his diary, ‘seemed to understand their jobs’. At 8.00 the howitzers started registering and the troops had breakfast. Paterson describes the bombardment of strong-points as ‘tentative […] all the morning’, only ‘warming up’ between 11.00 and 11.25 when the Turkish front line was the target. 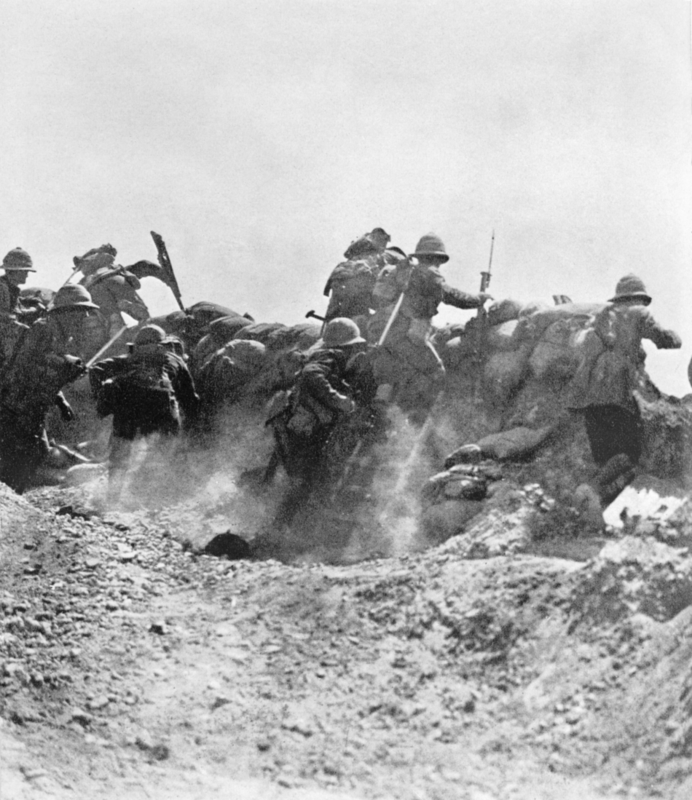 The wind was now stiffening and blowing a thick cloud of fumes and dust back to the KOSB trenches. At this point the troops performed their ‘feint’ of cheering and showing their fixed bayonets above the parapet. ‘There was no doubt’, Paterson wrote, that the Turks were in their fire trenches, ‘as I have never heard such heavy rifle and machine gun fire.’ The ‘intensive’ bombardment of those trenches then resumed. Platoon No. 8, commanded by George Calderon, was in support trenches on the extreme left of the KOSB line, touching the strip of scrub. It would be in the first wave of assault, comprising A and B Companies. George seems to have given his men a tot of brandy each. A witness statement dated 13 July 1915 says that he then ‘picked the leaf of a certain shrub, and told the men to do the same and to chew the leaves, as these were said by the Turks to give vigour. All the men near picked leaves and chewed them’. At 11.55 they moved up into the fire trench that they had prepared on the night of the 2nd. ‘The Turkish fire’, wrote Paterson, ‘was still very heavy’. The first wave was to go over the top in two consecutive lines, A Company first on the right, B on the left. A Company mounted the ladders. At noon the whistle went and they leapt over the sand bags. Simultaneously, Turkish machine-guns opened fire right along the top of the parapet. As an eye witness, Sergeant-Major Daniel Joiner, put it, ‘instead of going forward, [A Company] either fell back again wounded or killed’. There was a lull in the fire, within seconds the whistle went again, and George led his men forward in B Company. 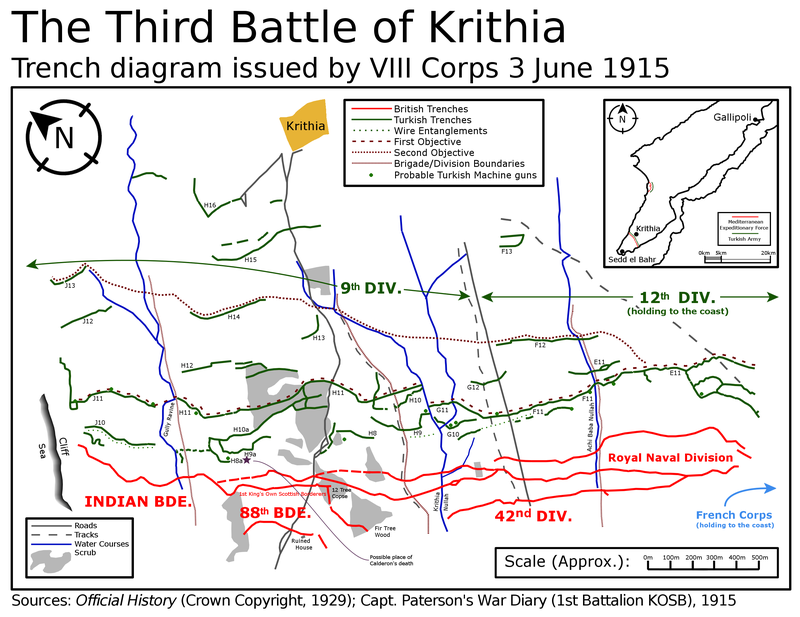 The 1st Battalion King’s Own Scottish Borderers go over the top at noon in the Third Battle of Krithia, 4 June 1915. Published by kind permission of the Imperial War Museum. From where we stand on this side of the parapet, George had ‘vanished in the smoke of battle’, as so many of his friends later put it. But it is the job of a biographer to go with his subject to the very end. George’s first biographer, Percy Lubbock, understood this and stated: ‘George was seen to fall, severely wounded, in the open. He was close to a Turkish trench, however; [so] there was a chance that he might prove to be a prisoner.’ But this was a vain hope. Exhaustive study of all the published and unpublished evidence suggests that George, with his superior running skills, managed to get over a hundred yards towards the nearest Turkish trench, H9a, with men falling all around him. The trench itself was about another thirty yards ahead. At this point, I believe, he was hit by machine gun fire from H8a, in the Worcesters’ sector, or even H8 on the far right, as Paterson says that ‘all our losses had been caused by cross-fire from the flanks’. Only one officer from B Company survived. This officer, and the witness whose statement was dated 13 July, believed that George was killed outright. I agree, and naturally I hope it was so. According to Paterson, ‘nearly all the corpses we got were hit six or seven times’. This entry was posted in George Calderon, Timeline and tagged biographies, biography, Captain Paterson, Dardanelles, death of George Calderon, Essex Regiment, Final days, Gallipoli, George Calderon, Gully Ravine, Hampshire Regiment, King's Own Scottish Borderers, Krithia, Percy Lubbock, Royal Fusiliers, Royal Scots, The Great War, Third Battle of Krithia, trench diagram, Twelve Tree Copse, W Beach, Worcestershire Regiment, World War I. Bookmark the permalink. In his frank and witty smile. In body and brain so bold? And who hid a heart less cold?